I mentioned before in one of my posts, that I went to the farmer’s market and picked up all tips of veggies, beans and peas. Red lentils was one of them. I also received a VIP bag at the Philadelphia Magazines Philly Cooks event which came with a big bag of red lentils. I decided it was time to start using these lentils. I didn’t want soup. I wanted something different so I went with making a burger. Topped it off with a nice greek yogurt sauce and alfalfa sprouts. It turned out great, and reminds me of a falafel. I hope you enjoy. Bon Apetite. Take a large pot and on medium heat add olive oil. Then add onions, carrots and seasonings plus bay leaves to cook for about 3 minutes or so. After that add lentils and stir. Then add water and cover. Cook for about 20 to 25 minutes. The red lentils will puff up a bit. Try them. They should be soft but not too soft. When done let cool and chill for about 2 hours or so. Then add bread crumbs to the mix and form patties. Should make about 8 patties. Take a skillet and place on medium heat, drizzle some Olive oil. Place patties and cook for about 2 to 3 minutes on each side. It shouldnt take long to get a nice golden crust. The great thing with this burger is you dont have to worry about any raw meats or eggs not being cooked all the way through. Chop up cucumbers place in a bowl, add yogurt, salt, pepper, cayenne and dill. Mix everything together. 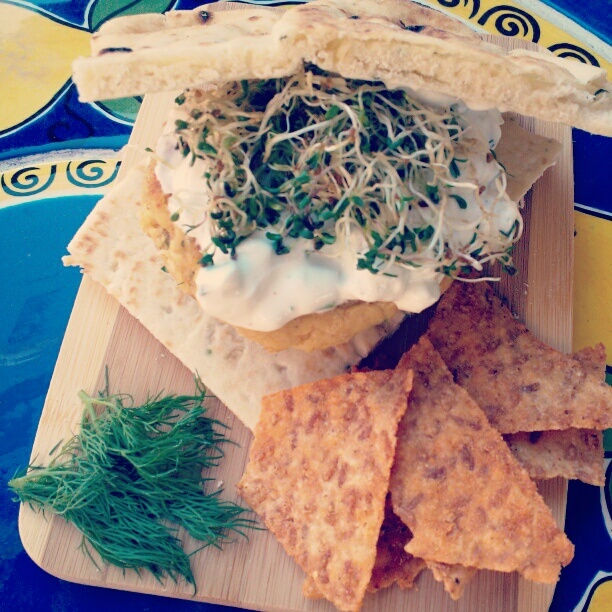 Take the Naan and cut it in half and put burger on it topped with yogurt sauce and alfalfa sprouts. Along side I had some Chili Riceworks chips.